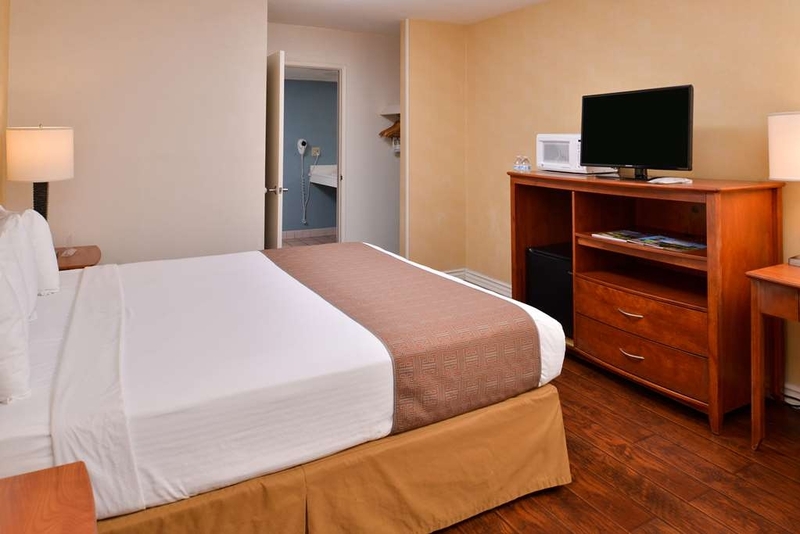 The Best Western Palm Garden Inn is ideally located in the center of Westminster. Come and experience our hotel near the major tourist attractions. Best price guaranteed and exclusive deals. 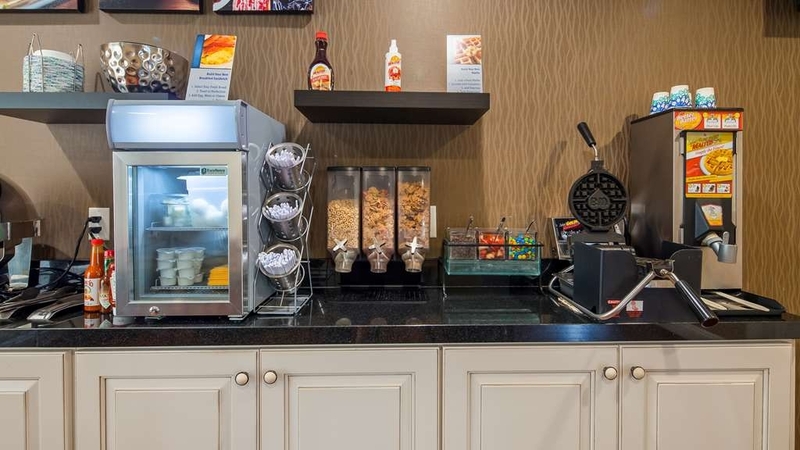 Start your day off right with our many choices of breakfast items for our daily continental breakfast. Welcome to the Best Western Palm Garden Inn. 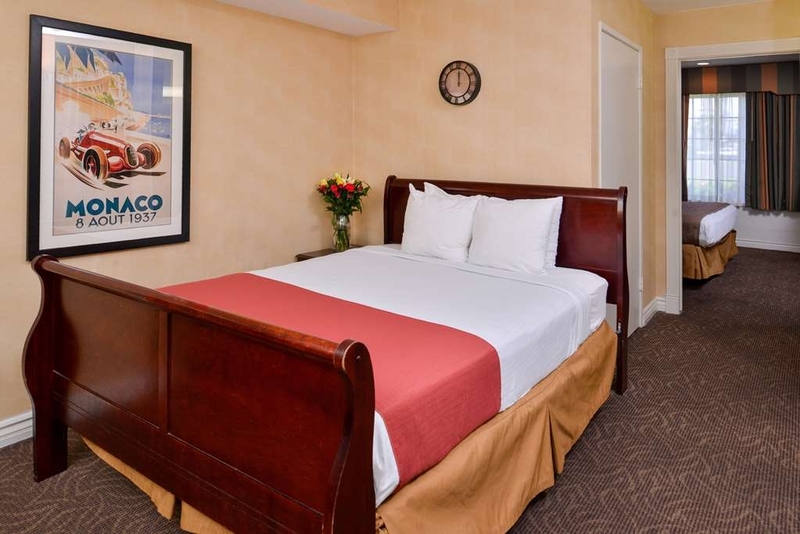 We hope you enjoy your stay in this Double Queen guest room! Relax in our king bed guest room with an in-room hot tub. Our 2 bed suite includes a two room compartment, a standard king and queen bed which are separted by a door with one entry/exit. Our 2 bed suite includes a two room compartment, a standard king and queen bed which are separated by a door with one entry/exit. On behalf of our entire staff I would like to thank you for staying with us. I will share your kind comments with our staff! Once again thank you and if we can assist you in the future please contact us directly. Overall I'm very pleased with my stay & will be staying here in the future! Tony the general manager was very professional & Ellie is very bubbly & helpful. Chris gets the job done & is courteous to everyone who's eating breakfast. Thank you for taking the time to provide feedback regarding your recent stay with us at Best Western Palm Garden Inn. It is our staff's goal to exceed all of our guest expectations and to provide a professional experience. We hope to see you again in our future reservations. This affordable hotel was super clean, and the entire staff was friendly and helpful. 2 adults, 2 children, 2 queen beds, 2 nights. We chose this hotel for our Knott's Berry Farm vacay. It was safe and cozy. You can drive to the local Walmart in 4 minutes without going on a public street. The pool and hot tub were both clean. If you're a family looking to save money but stay safe and clean, this place is a fine choice. The desk staff are all wonderful and friendly. Special shout out to T, Chris, Ellie and Tony. Haha, our kids and I were in and out for breakfast quite a bit and the desk people were super every single time. Thank you for taking the time to provide us with feedback regarding your stay at Best Western Palm Garden Inn. We are glad you enjoyed your recent stay. We are located near Knott's Berry Farm and Disneyland. We have a hot breakfast every morning from 6:30 a.m. - 10:00 a.m. We are glad we could meet up to your expectations and we hope to see you again in our future reservations. enjoyable place. Good customer service and clean rooms. The breakfast was good and the employees were very nice. Good price. The mattresses were comfortable and the location was good. They have an outside heater and tables that you can sit outside and eat breakfast. Thank you for taking the time to provide us with feedback. We take great pride in providing superior customer care and would like to thank you for choosing to stay with us. We have free hot complimentary breakfast every morning. We are located near Disneyland, Knott's Berry Farm, Little Saigon, and Korea Town. We are glad you enjoyed our new breakfast patio area that provides our guest with more space to eat. We hope to see you again in our future reservations. Had a great visit enjoying some business and leisure. Friendly staff and comfortable stay with free breakfast. Close to many attractions, especially the beach. Had so many choices of restaurants nearby. Great customer service. Very welcoming. Accommodating. My car battery died in the parking lot and they called triple a to come help me. So very grateful for that. Clean rooms. Nice hardwood floors and nice furniture. Working appliances. I would recommend this place to anyone. I will definitely be going back. Thank you for taking the time to provide us with feedback, it will help our hotel improve. We thank you for providing us with positive comments regarding our staff, and the experience you had during your stay. We hope to see you to see you again in our future reservations. I was staying with my family,we came to SoCal to go to Disneyland, This hotel was close to Disneyland. Easy access to the freeway and park. The staff gave great service, the rooms were clean and comfortable. Thank you so much for filling out a review for us. We really appreciate your comments. It is our staffs' goal to exceed all of our guest expectations and to provide a professional experience at Best Western Palm Garden Inn. We are 15 - 20 minutes from Disneyland, and we are located next to the 22 freeway. We are glad you enjoyed your recent stay with us. We hope to see you again in our future reservations. "So nice to have close by"
Staff is awesome and have availability for me when I was in a bind. Comfortable. Clean tub. Close bar. But if you get a early checkout with a breakfast on request expect muffins. apples and oranges. Wonderful place to stay and friendly people. Thank you so much for filling out a review for us. We really appreciate your comments. It is our staffs' goal to exceed all of our guest expectations and to provide a professional experience at Best Western Palm Garden Inn. We have a complimentary hot breakfast from 6:30 - 10:00 a.m. We serve sausages, scrambled eggs, and many pastries. We hope to see you again in our future reservations. The hotel was nice. My only real complaint was the dirtiness of the floors. Walked with no shoes on and my feet were disgusting. The beds could use some improvement. Other than that I was very satisfied with my stay. They offered eggs, toast, waffles, coffee and some pastries for breakfast Breakfast area is small, and easily crowded. Walls were thin and we could hear our neighbors through the night. Despite that, the staff is very friendly, professional and helpful. Thank you so much for filling out a review for us. We really appreciate your comments. These help us to improve our property and we strive to improve daily. It is our staffs' goal to exceed all of our guest expectations. We hope to see you again in our future reservations. "I stayed overnight and was very satisfied ." The place is very clean and the amenities are all ok. I was particularly impressed with the room design which was cozy and feels like home.The staff were all helpful and accomodating. I enjoyed the breakfast too. Would definitely book at Best Western Hotels in the future. Thank you so much for filling out a review and choosing to stay with us at Best Western Palm Garden Inn. We are glad you enjoyed your stay and able to accommodate you with our breakfast. It is our staff goals to exceed all of our guest expectations and to provide a professional experience. Our property includes a hot breakfast with sausages, scrambled eggs, and pastries. We will see you in our future reservations. This is a great value and location. I've stayed twice in the past few months and it was a great experience. Very quiet, clean, good breakfast and the table in the room in addition to a desk is a great bonus. The wifi was very good also. Will be back. "Not Fancy BUT Worth the Price, Rooms Were Good, Breakfast was Okay." The rooms were average but good for the price. This was typical "you get what you pay for". This was an average or above hotel. It was very near a busy street, but far enough away to provide quite and privacy. The pool was in a simple fenced off area near the parking lot (but was being worked on when I was there). It is near everything including 15 minutes from Disneyland. I would certainly stay there again. The breakfast was "okay" expect scrambled eggs, and 1 hot meat, cereal, and small danish. They restock regularly, but if there are a number of people there, they can only expected to do so much replenishing. The food/dining area is very small and flows into the main office/check in area. When the area is busy you may not have a seat or table for breakfast and will need to go to your room and come back for more. With all that, I would still stay again and adjust, learn from prior experiences. The bottom line is "how less expensive do you need to go?" Hello Steven N, Thank you so much for filling out a review for us. We really appreciate your comments. These help us to improve our property and we strive to improve daily. We are 15 minutes from Disneyland, 20 minutes from Knott's Berry Farm, and 20 minutes from the beach. It is our staffs goal to exceed all of our guest expectations. We hope to see you again in our future reservations. "The Best Best Western in the West"
I've been coming here for years and rarely do I ever encounter any type of problems. The staff are truly down to earth people and go out of their way to make you feel like as comfortable as you can possibly be. The amount of effort they put in is ridiculous! I always leave very satisfied! Great location and proximity to attractions. Updated and clean rooms. Great breakfast choice I've paid at other hotels. Staff was friendly and very accomodating. Had a great time and will use again when we visit the area. We stayed in 6 hotels during a recent trip to California from London and this was the worse one by far. Room was really outdated and had a door to the next room where we could hear everything that went on. The front door wasn't sealed very well and the noise outside all night was really bad. Breakfast wasn't good either This was the most expensive (budget) hotel we used and the worse. "Do not meet my expectation"
Hotel cleanliness was ok. No elevator, hotel was so noisy. Staff was just ok. Breakfast selection was poor. Don't let their advertise fool you. I was so disappointed when I arrived and looked at their property - the property did not look attracted like it was on their advertise. Hello, We sincerely apologize for not meeting your expectations, and we are disappointed that our hotel didn't meet your expectations. Our hotel is a small property and we do not have any elevators. For our breakfast selection, we do have scrambled eggs, sausages, breads, bagels, and other pastries. We apologize once again for not meeting your expectations for our breakfast. We hope to see you again in our future reservations and we hope to meet your expectations and exceed even further. Not a bad hotel. Bed a little uncomfortable, very nice staff, breakfast was decent except OJ and very convenient location to the local hospital where I was visiting a friend. Would stay there again and recommend to others! Thank you for getting these issues to our attention. We sincerely apologize for any inconveniences this may have caused, and what you may have experienced. These issues usually do not occur. But, we hope you will come back and stay with us again. We are in a location, we are near Disneyland, Knotts Berry farm, and other local areas. We hope these issues do not have happen again during your next stay. "Best “Best Western” I've been to so far!" Just visited this Best Western 2 weeks ago for our trip to Disneyland for 3 nights and it was one of the best Best Westerns I've been too so far. They have great breakfast options and choices for you to choose from which is really a plus since it's all free. It could have well been over $20 per person at other high end hotels. The rooms seem really updated and remodeled so it really compares to some luxury star hotels at very discounted price. The staff is excellent and very helpful in places to dine with kids nearby. Can't wait to go back in couple of months. Hopefully we'll be able to use the pool by then with warmer weather as it looked really inviting. Fairly nice room. No carpet (bonus). Linens were clean and good location for us. However we arrived late & there were ants in the bathroom. We didn't say anything til morning as we really didn't want to move rooms again or to spray while we were there. Other than that,everything was fine. 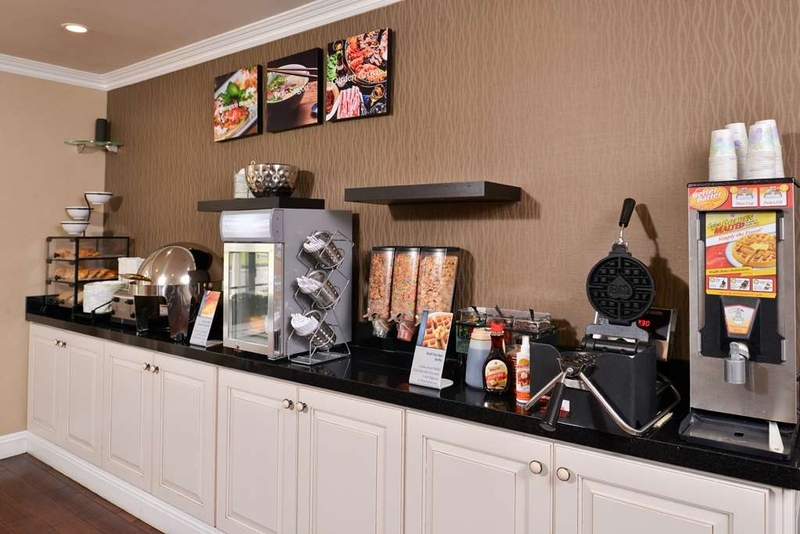 The hotel is about 15 minutes from Disneyland on a nice area.The complimentary breakfast is fine with several options: scrambled eggs, meat patties, waffles, yogurt, bagels, bread, cereal, apples, bananas. Housekeeping must immediately improve though. You can tell they have no supervision.Overall experience was fine. Would stay again. Hotel was nice, had hardwood floors which was nice. Breakfast was good and they kept it well stocked. The location was slightly inconvenient cause it wasn't off the main road and if you wanted to go north well it was difficult cause there was too many cars heading south so it was impossible to turn left from the hotel. Hello, Thank you for taking your time your time to provide us with a feedback regarding your stay. Yes we are located on Beach Blvd, and it make take some time to make a left as the street does get busy. We suggest making a right turn and then making a u-turn. We are glad you enjoyed our breakfast and we will report this to our breakfast attendants. "The Best Price in Town"
Thank you Ray for taking your time to provide a positive feedback. We appreciate your you staying with us at our property, and we are glad that you were able to enjoy your stay with us. Great stay ...would highly recommend this Best Western. Stayed her for a concert, conveniently located near everything and about 20 from the Pacific Amphitheater. I would highly recommend staying at this hotel. "BW Palm Garden Inn, Westminster"
good location, nice comfortable room, very friendly hotel staff and convenient parking. It would be nice to have a gym. breakfast start at 7:00am which is kind of late. I like staying at this hotel whenever I am in the area. It is a safe place to spend the night. "Fabulous breakfast, clean hotel with beautiful grounds and kind staff"
We LOVED staying at this hotel. The week before we went economy and had a really negative experience. I decided to go a little bit nicer and I'm so glad that I did. Our favorite part of the experience was the amazing breakfasts. They had waffles, scrambled eggs, sausage, cereal, oatmeal packets, fresh made yogurt (super yummy), juices, bagels, real sourdough bread, doughnuts, English muffins, and more. It was delicious. Each day they would bring out different fresh fruit like strawberries, nectarines, grapes, etc. It was close to everything. It was a 20-minute drive to Huntington Beach Pier. We spent a lot of time there and loved it. It was also close to Disneyland and Downtown Disney. Little Saigon was very close by. There are also a few great parks nearby that the kids enjoyed. The room was very clean with comfortable beds. The location felt safe and secure. The front desk staff was kind and welcoming. It had been a long day and they offered me fresh fruit and yogurt. They set me up with my room and then helped me when I wanted to stay another night. They even got my next room ready before check out time so I could just move things to the new room. 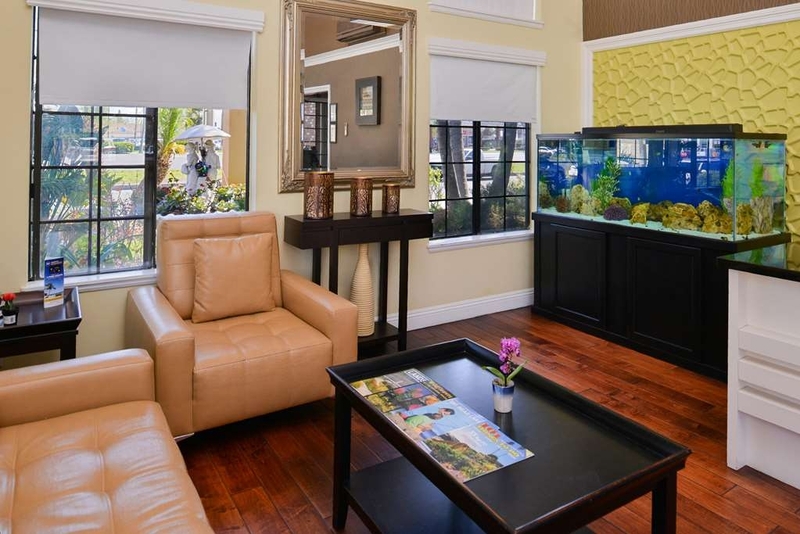 The lobby always had fresh fruit and they had a new fish tank with beautiful tropical fish. The property is beautiful. They have tons of trees and plants. I loved the grounds. The pool was clean, nice-sized and the perfect temperature. The hot tub was great. This is our new favorite beach hotel. We felt welcome and safe. I would stay there again in a heartbeat. The hotel is a bit older but well-maintained and quite clean. The room was quiet and there were no noisy guests during our stay. The front desk staff were cheerful and helpful. The free breakfast was typical - cereal, eggs, breakfast meat, waffles, bagels and other breads, juice and coffee. We were disappointed in only one aspect: the eggs served at breakfast were VERY salty. Other than that we had a very pleasant stay! This place is a nice and clean Best Western. Great value. It is close to lots of tourist places. The staff was very friendly and the room was comfortable. Breakfast and wifi is included which just increases the value. It is a small property and sometimes gets a bit noisy, but to be expected since alot of families stay there. Good afternoon Kim, Thank you for taking the time to review your stay, we sincerely appreciate it. As you mentioned, we are are a central location in Orange county which allows our guests to easily navigate between locations such as Disneyland, Knott's, Huntington Beach, and Little Saigon fairly easily! For any future reservations, if you prefer a quieter location please feel free to let us know and we will do our best to accommodate any requests! Once again, thank you for your review and we hope to see you soon! "Looked Good from the outside"
Thank you for your review on your previous visit. We appreciate any feedback from our guests since it allows us to only improve! We hope your next stay allows you to enjoy our pool area as well as our complimentary breakfast! This was our second time staying at this hotel when going to Disneyland. It's not a far drive to the parks & what you save in price of staying further away from park is more than what you have to pay to park at Disneyland so that was ok with us. The first time was in a 2 bedroom suite & it was great with a bathroom separating the 2 rooms. Both rooms had little fridges & tv's. This time we stayed in the King room. It had a tv, fridge, microwave and table & 2 chairs to eat at if you wanted. The room was clean and the bed pretty comfortable. The only thing that would have made it better was a pillow top bed. The breakfast they provide is yummy. We always went down right when it was available so we could head to the parks early. They always offered us a fruit & water to take with us. I will stay here again. Hopefully by then they will have the pillowtops on the beds like the Best Westerns have right next to the parks. But other than that they were very nice and when I asked for a second blanket got it for me right away. We had two rooms for our family and were in Palm Garden Inn to stay for a funeral. The staff was friendly and helpful and was kind to members of our family who came to visit us. WE could have not asked for a better stay. Breakfast was great and nice we could eat there before an early funeral service at 9:00 AM. The facilities were great. Upon arriving, it took only a few minutes to check in. The room was very clean, had a spa and a shower...did not expect a spa in the room. Had a Keurig machine in the room so was able to get a fresh cup of coffee after the long trip. Free continental breakfast was available in the morning, the selection of items had something to please everyone. Checking out of the hotel was also as quick as checking in. I had stayed at this facility in the past and will do so again when travelling through the area. "Business Stay in BW Palm Garden Inn Westminster, CA"
I checked into this hotel for a business trip. It was very centrally located near my appointments and the freeway. Service was very good as well as the breakfast which remained open until 10:00am (unlike others that close by 9:00am). THE BAD: Check-in set the tone for the rest of my stay at this hotel. Bizarrely, the lobby smells like body odor, and the parking lot smells like feces. I stayed in room 103, which is around the corner from the lobby and immediately next to the ice machine. The foul sewage smell from the parking lot was really potent in my room, especially in the bathroom. There were long, black hairs on the hand towel and on one of the bath towels. The mattress and pillows are really uncomfortable, the A/C works well but makes a horrible grating noise, the walls and floors are thin enough that we could hear our neighbor's TV, and the noise from people visiting the ice machine kept us up all night. THE GOOD: There was a Keurig and 4 K-cups conveniently located in the room. I also liked the size, look, and layout of the room. The continental breakfast consisted of powdered eggs, sausage patties (mine had a piece of bone in it), cheese danishes, bagels, muffins, cereal, and DIY waffles. ANALYSIS: I won't be returning. It definitely wasn't worth the $130+ I paid; I've stayed at much nicer hotels for under $100. In comparison to the Best Western we stayed at last May, this hotel and location was much better. We didn't experience any discrepancies and felt very comfortable. Breakfast items could have been a little bit better with variety, but the food tasted great! The room was spotless. The shower was challenging to turn on though until we figured out how it worked. Otherwise, our stay was very delightful. Thank you. "Very good hotel, clean and well located"
I recommend this hotel, very clean. Employees are very nice and professional. Hotel is well located, close to good restaurants. Rooms are big and well furnished. Only improvement point relates to the quality of the food for the breakfast. Good morning, Thank you for your review on your past reservation. We thank you for your kind words and accept any suggestions towards improving our complimentary breakfast. Once again, thank you and we will see you soon! It was clean, the rooms were spacious, staff were nice and I loved the chocolates at the front desk. There was some cons like certain rooms smelled horrible and it was noisy at night, but overall it was okay and my experience was pleasant. 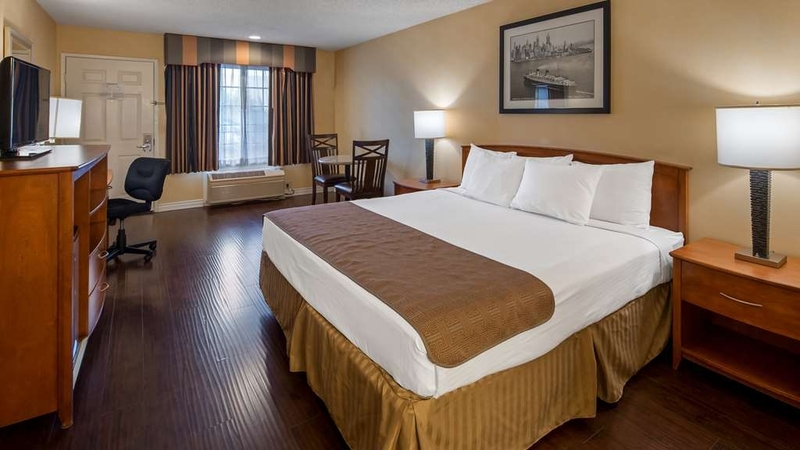 I had a five night stay at Best Western Palm Garden Inn and I was happy with the service I received and the quality of the location and the room compared to what I paid. Not to mention free breakfast, parking and wi-fi. The breakfast menu and presentation could improve though. "Close proximity to area attractions." Great boutique hotel with super friendly and helpful staff. Great central location to many nearby attractions made it easy to visit. It was close to the major freeway ramps so great to return to your hotel after a long day out. Clean with lots of upgrades. Wanted to thank the staff at the Best Western Palm Garden Inn. The rooms were neat and organized. The staff was friendly and extremely helpful. I will definitely continue to stay at the Best Western Palm Garden Inn. On a scale of 1 to 10 I would definitely rate my overall stay a 10! "Good, short stay at BW Palm Garden Inn"
Ellie at the front desk was great to get us into our room early on Saturday, which was a big help. The included breakfast was good as we took advantage of the waffles, sausages, yogurt, muffins and juice. The eggs were not too tasty. The room itself was clean with all the needed amenities, including a microwave and mini-fridge. The beds were a little soft, but did not affect our sleep in anyway. We did not us the pool, but did see active groundskeepers and housekeeping staff at work. Parking paces were small,but the hotel had enough parking for all of the guests. For the price we paid, the location was perfect and the overall experience was great. "Don't stay here, or anywhere in this area"
I've stayed at this hotel before and choose to stay here again. It's very conveniently located, clean, great bed and pillows, and a friendly staff. I rated this stay 4-stars instead of 5-stars because of the TV cable box getting stuck on programming and the battery died in the door lock to our room. Overall we enjoyed our stay and I would stay here again. The rates for the room was outrageous and the breakfast wasn't as good as Marriott Courtyard and prices BW was higher than Marriott. The reasons we staying at BW just the trafficking just horrible. The breakfast at Marriott is 10 times better than BW. The rate is much cheaper than BW. Next time Marriott not BW. Other than the breakfast being mediocre, we had a good experience staying at this hotel. The staff was friendly, it is in the a good location. We had a jacuzzi spa room, the jacuzzi is not quite big enough for two people but the idea was still nice. We both fit in it but it was not very comfortable. We came here for a quick family vacation to Disney. Really looked forward to having a good breakfast that was INCLUDED in my stay. After breakfast we went to the HEATED pool which was perfect since it was 60 degrees outside. The only thing I would change is the beds because they are pretty uncomfortable and the wood floors make everything feel sticky. My family and I stayed there in a suite for 4 nights. We were Having a lil vacation and visiting Disneyland. The location is prime, the staff is well dressed, great manners, and attentive to guest needs without hesitation. The breakfast was hearty, the hotel was clean, the wifi worked great, all the amenities were in perfect working order. We will be staying there again. 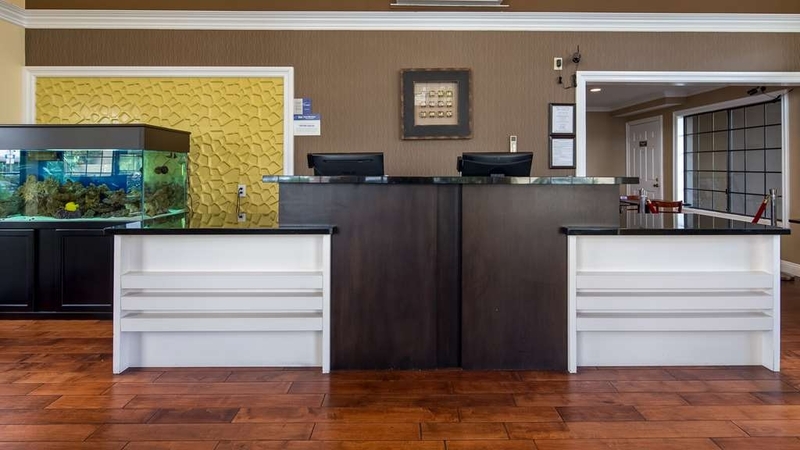 "Great Value and Wonderful Staff"
This is a great find if you are looking for a modest hotel in a convenient location with great room rates. The rooms, and beds more importantly, are comfortable. There is also adequate parking and breakfast is more than just danish...However, there is a bit of street noise, and the hotel itself is a bit run-down. We are repeat visitors at the hotel because we have always had good service by the staff and think it is a good deal for the price. "They Made our Thanksgiving Break Awesome!" It was Thanksgiving Day and we had to be out of our other hotel room by 11:00 a.m. Jessica called me and said our room was available earlier on Thanksgiving Day! She gave us an added level of comfort, especially since we were several hours away from home. Just a small gesture made everything excellent! We will be coming back! Upon arrival, Teolula greeted us and was able to check us in. Wonderful person! Due to some maintenance issues at our home, we had to stay at a local hotel for a few days. We were pleasantly surprised at how nice the room was and how comfortable our stay was. It was a stressful time for us, but coming into a peaceful and clean space was very nice. Also, the staff was excellent and very helpful. They were very professional and attentive. So we came here as a family. I did my reservation online through this app. And everything went well with that. The staff was friendly and very welcoming. We used their pool, the water was super cold but the heat made it bearable. Their hot tub felt grear and it was very clean. Their pool towels were small though, available right there by the pool. Where there is also grills available to bbq. Our room was comfortable with two beds. The sheets were clean. We were on the bottom floor and the room had wooden floors. We had a small fridge, a tv, microwave, coffee maker, hair dryer, iron and a desk available to us. The restroom could use an update, it seem rather old. The towels were clean and they had shampoo and bodywash available. The breakfast was disgusting, at some point we all got sick from it. The eggs are probably from a box and were to watery. Their bacon was like turkey bacon and it smelled old and tasted old (we think that is what made us sick). The second morning we ended up just getting toast, some jams, fruit and yogurt. At some point there was no apple juice available, when we asked the stuff for it, they said well there is judt none ?? I mean I know is free and all, but I feel like things should be availabled if offered. Overall it served its purpose (for us to be close to Disney and the beach). Oh also there is a taco truck that parks there at night, best tacos ever totally recommend it. First, the good: staff was awesome and accommodating, breakfast was superb for a 2 star hotel, cleaning staff was wonderful. The down side: because we got the room cheaper through Trip Advisor, we were given probably the worst room they had. It was not updated, old carpet old bathroom with wooden cabinets that were nailed shut and painted over. It was right next to the office and ice and vending machines. We did asked to be moved and they gave us a new room immediately. New room was amazing. Also, we were supposed to get room for $82 a night. The first and last night they charged us $101. I enjoyed the stay at the one in OC. The room was good and the breakfast was decent. The bed was comfortable to sleep in and overall the room was very clean. I did not have any problems throughout my stay. "Great staff loq quality beds and outdated"
Very outdated bad quality beds. Very dusty floors. Beds were hard as woods. Location is not bad for travel distance to the huntington beach. Bud I wouldn't prefer it to stay with my family or my self there again. "You will want to come back next year!!" We stayed at this hotel for the us open of surfing.i had a blast .stuff were very helpful and the room was super clean,only the pool water was not very clean ,other than that everything was excellent.i definitely recommend it . Overall stay was pleasant. However the air conditioning system was very loud and difficult to regulate. It made sleeping well difficult. Room had hardwood type flooring which was definitely cleaner than carpeting. Staff was polite and friendly. Everyone was working hard to make things nice for our stay. Checking in was easy and fast, easy parking. Very friendly and eager to get us into the room so we could start on fun times. Mornings were a great joy because everyone was always smiling and wanting to make sure we were okay. Life was so pleasant there for our 7 days at the Palm Garden. Checked in. Said we do not give people who book through a third party a double bed room. We slept next door to a double bed room that was empty for all four nights. Lady was rude and entitled. Will never go back. It's a motel. Thank you for reviewing your previous stay. As we mentioned during check in, you made your reservation directly through Expedia.com or an Expedia partner site, for a King room for 2 adults, not a room with double beds. Per your agreement through the third party you were granted with the reservation for the room type that was initially booked. We apologize for any inconvenience this may have caused your stay as we were unable to move your reservation to another room type since those room types were already specifically reserved previously by other guests. For any future reservations we do encourage all guests to book directly through bestwestern.com or the property itself to ensure the proper accommodations. The hotel is clean, quiet and have friendly and helpful staff. 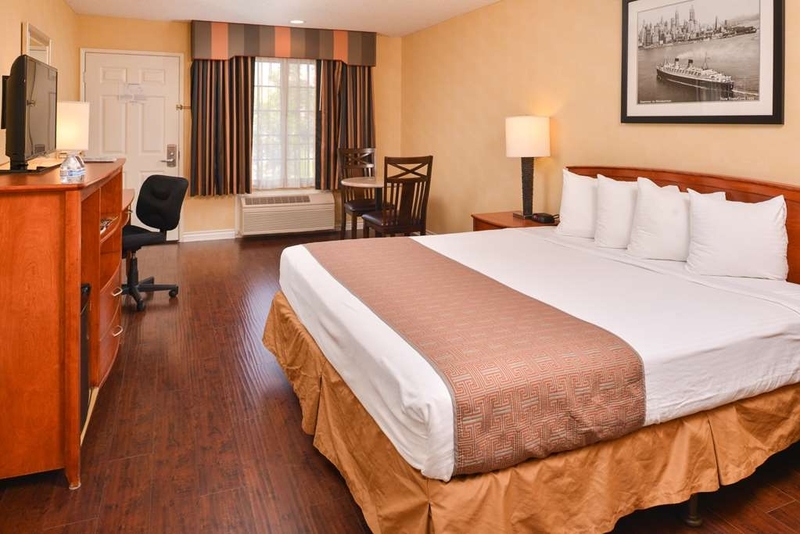 We frequently stay in the Anaheim area and will definitely be staying here again. Would recommend this place to anyone wanting a great value for a great place to stay. Great place to stay in Orange County. We have been staying here for many years. It is down the street from "Bobs Burgers" a great place to eat. This location is close to many of the attractions in the area. We had a wonderful stay. Front desk were friendly and helpful. Breakfast was awesome and room was clean and comfortable. Location is central to all kinds of family fun. Beach is close. Great restaurants near by as well. All in all we enjoyed the visit and will return. "Never have been let down"
Nice with pretty palms and banana trees. Odd location among car dealerships. Breakfast similar to most hotels and fruit of low quality. You can drive to the ocean which is about 15 minutes to the southwest. "As Expected for Best Western"
It's not bad. Not like a high end hotel. Rooms could've been bigger. Bathroom had some hair that wasn't cleaned up. A lot of exterior noise but that's not their fault. Breakfast was the typical hotel breakfast. "Worst place to stay "
My wife and I got a jacuzzi tub room and it was excellent. We stayed for one night and relaxed in the tub. The timer on the jets in the tub was kind of short in my opinion (maybe an hour max) but otherwise it was a fantastic room. The bed was nice and we were very happy with the whole experience. We'll definitely be back again. Excellent Stay! The hotel was clean and looked to be recently renovated. Room was a nice size, good big screen TV with cable channels, fridge, good size bed, nice size shower, etc. Front desk staff was very friendly, and he parking was great too. The hotel is loud. There are kids running around constantly at all times of the night. If you get unlucky and have to stay by the pool you will be subjected to the yelling and screaming from adults and kids at the pool, so I would suggest staying away from the pool area. The front desk attendant was awkward. Wouldn't stay here again unless you have kids and don't have to work because you won't get much rest. "nice compromise between location and price"
LA is very spread out, but this hotel presented a nice compromise between location and price. It is fit into a tight location, but we had adequate parking. Breakfast was nice, as was the pool. Near the 22 and 405 freeway to take you east or west. Also, you can drive south on Beach Blvd. for about 20 minutes to reach Huntington Beach, the ocean and the Pacific Coast Highway. The employees who checked us in and out were very friendly and helpful. We were happy with our stay here! "Thought we were staying in the suite haha"
Great little hotel and very spacious room provided :) Very helpful and friendly staff. I just wish they provided the extra pillows that I requested and had a little more items on the breakfast menu but other then that, it was great! Will certainly stay at this location again if I'm in the area. As the title says!!!! The clientele the night I was there seemed to be the " let's get drunk and be loud all night" type. The walls are paper thin and you can hear everything going on inside and out. Bed was ok. Linen was old and scratchy. Room decor nice and laminate flooring throughout is VERY nice. Nice friendly staff at check in. "Room is OK for the price, but... "
..It was not clean. There was long hair everywhere and a intense smell of closed room. Breakfast was a not ok. Not enough room for everybody and really dirty tables, chairs and floors. With that being said, the beds were really comfy and it was nice and quiet. "No Accountability for Mistakes the Staff makes"
I left an Apple Watch charger. Was told they had it and that they'd call back with the price it costs to ship it back to me. Never received a call back just a receipt for the charge and a tracking number. The shipping address was never confirmed with me, so they sent it to the wrong address. I asked why they shipped without confirming address and I get an apology from the staff member (Tony) that made the mistake.. told me he'd call me back with next steps. Then general manager, Jessica, calls me back and tells me it'll cost more to intercept the package, but when I ask her why I need to pay for their mistake she says the address was confirmed with me twice.. which was a COMPLETE LIE! Not only will they take accountability for their mistakes, but will make you feel as if you're the one lying! I asked Jessica for her superior's name and number and she told me that information was not available to me. Will no longer stay at any BEST WESTERN hotels.. a company like that does not need my business and I'll make sure to make everyone I know aware of this!! The carpet was always damp, the beds were uncomfortably hard, the linens scratchy but the worst part was the extremely lumpy, sofa sized bed pillows with pillow cases folded over them. I called and asked for better pillows but never received them. Everything was very nice and I would love to go back when I get my vacation. The employees were very kind and the room was really clean. The environmen of the hotel gave me good vibe through out all days and nights. "Best Western Palm Garden Inn"
I stayed at the Best Western Palm Garden Inn on a business trip. I was extremely satisfied with my stay here. The staff and front desk were super friendly and considerate of guest needs. The high speed internet was indeed high speed. The breakfast was delicious and had a good variety of items. The room I stayed in was clean, comfortable, and the privacy was good. The hotel is good for the price. The parking is tight and I was not impressed with the breakfast but it is very close to Disneyland, Knott's and several restaurants. The staff were very friendly and nice. The pool is small but good enough for kids at the end of the day. We'll definitely stay here again !! From service to over all the whole stay was awesome. Very friendly staff. Always ready to assist in any way possible. I will recommend this hotel to friends and family for sure !! The night before we stayed here, we were at BW near Santa Monica, which was very nice. Do not be deceived by the photos. The hotel is Ok visually, but the district is a bit shabby. Our room was very average, with hardly any natural light. The breakfast room was also part of reception, and odd. The worst bit was the hot tub which was so chorlinated, I could taste the fumes. My 12 year old son, who has NO allergies, complained of itchiness, and had a mild rash. We were only in it for less than two minutes. As an aside we went to a local Vietnamese restaurant (another review) - disaster. When we first checked in, the employee referred some food places and beaches to visit on our stay, very helpful! Staff was very kind and helpful! Great and safe location. Close to Walmart and Costco, freeway, gas stations and family friendly restaurants. "Family friendly, reasonably priced vacation stay location"
Nice, well maintained place. Pool and hot tub outside. Jacuzzi in room. Friendly staff. Breakfast was included in price. Only thing missing for me was an room safe, but that won't stop me from staying here again, if I'm in the area. Stayed here on a short Disney trip. Rooms were cleaning and in good repair. Noticed maintenance staff doing a great job of staying ahead of the normal wear and tear. Overall a great price and location. Also close to the beach. The grounds were very well landscaped. I saw the maintenance staff working to great detail on the grounds. The desk staff were very bubbly. Housekeeping was very timely. Is located on a street which has many amenities - food, drive thrus, groceries, gas etc. Zero complaints! This was a good, not great, place to stay. The beds were nice and it was nice having a small fridge, microwave, and coffee maker in the room. The bathroom was in dire need of a re-model, the tile and grout were old and baseboards old, the tub was yellowing and the shower handle was hard to pull on and off. The breakfast selection was very good! I been charged twice. When I asked to have a copy of the receipt, they refused to give it to me. I feel that we ere not welcome there. When I asked to speak with the supervisor, I was told he/she is not available. "ALOT LEFT TO BE DESIRED"
My 3 boys and my self love this nice clean quiet hotel.The staff is very nice! Tony is the best at the front desk! Their is a lot of convient store and restraunts close by,and frwys minutes away. The rooms are nice and clean the beds are comfortable. 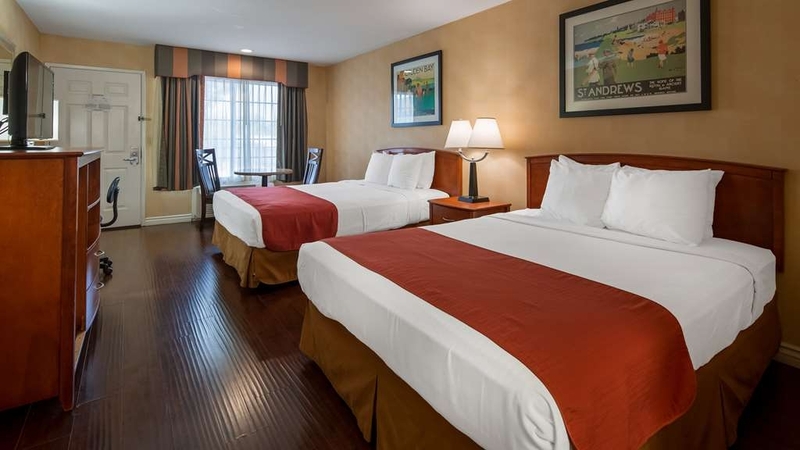 "Nice clean room, wonderful staff, convenient location"
We stayed a week at this hotel to attend a family reunion in OC. Excellent guest services: professional, kind, helpful front desk staff and housekeeping team. Our double-queen beds room is on second floor, standard hotel amenities but very clean and spacious. Comfortable beds with crisp white sheets and fluffy pillows. Well maintained bathroom, plenty of towels and hot water. AC works fine. Good WiFi. Large free parking area. Quiet and safe. A short drive to Little Saigon and all the fabulous restaurants on Bolsa Ave. The beaches are 15-20 minutes away. There's an Enterprise car rental located across the street. Going back to LAX, we opted for airport SuperShuttle service (a big thank to Jessica and Tony at front desk for the great suggestion!) which picked us up at the hotel on time as scheduled and gave us a smooth ride to the airport. Definitely will stay here again and recommend to friends and family. We stayed at the Palm Garden Inn during our Baseball tournament. The staff were friendly and courteous from front desk to the Housekeeping ladies. Pool and Spa felt wonderful after all day at the park. Breakfast ok, hardboiled eggs.. blah, would have preferred scrambled. My complaint is the unfriendliness to families with small pets. This is a hotel that does not accept small dogs. This will be a deal breaker for my family when we come back to the area as I don't like leaving my small dog at home. We made a last minute reservation at this location and were pleasantly surprised. It is a small property with very convenient parking. Our room was quiet and had everything we needed. The beds are not the very best, but definitely good enough. The staff is wonderful, especially Tony, who goes out of his way to help in every way possible. The breakfast was the best surprise! I usually cringe at the unhealthy choices offered in hotels. This one had hard boiled eggs, English muffins, yogurt, and fresh fruit. Of course, the usual unhealthy stuff was all there too--waffles, sugary cereals, breads, etc. They even had chocolate chips and M & M toppings plus whipped cream for the waffles! I found this hotel to be relaxing, quite and clean. The staff are kind and attentive. The Internet access is good and the morning breakfast is satisfying. It is located close to a freeway. A good value for your money. Great place to stay for economy minded business trip. A return visit for us. Well situated, easy access, very comfortable.The front desk Staff excellent. The Manager, Jessica, delightful. Breakfast very good. We were able to leave some of our luggage there while we went to Seattle,as we come back there for a further stay. This hotel was very nice. The staff was great. Great experience. Breakfast was served every morning. The staff went above and beyond to make my families stay comfortable. Close to restaurant and shopping, the hotel was in walking distance to our venue and 16 min from Disneyland. Again Great Hotel. Beautiful motel with lots of wonderful workers. Enjoyed our stay. Our stay was brief in the area and we dreaded the traffic. We experienced one small problem with express check out that we requested and did not get. "very confortable and friendly staff"
A good BW with lots of fresh fruit and good breakfast selections. No courtesy daily bottled water in room....only the first day. Bed was fine. TV good. Internet good, but needed daily refreshing or re-logging in. Room key needed recharging after two days for a five day stay. great place to stay, quiet,friendly. 75 cent for coke vending machine. the room is ok not that big. swimming pool only 5 meters, but good enough for the kids, they also have the spa next to the pool which is ok, not great. "Stayed close to family for reunion"
centrally located to a lot of attractions and easy to find. I liked it because it was a motel. pool was nice. the hot tub would have been nice but it had to many chemicals and when the jets were turned on it burned your eyes. other than that it was a pleasant stay. easily accommodated all done electronically, smiling friendly front desk staff, clean room, pool and spa. Quiet atmosphere, close to freeway, grocery stores, restaurant's and plenty of shopping of every type..
We stayed here after two exhausting days in Disneyland. It was the perfect place to relax after walking miles and miles between Disneyland and California Adventure with two kids. This hotel is far enough away from the hustle and bustle of Anaheim so that it seems very quiet, yet it is close enough that the trip to Disneyland is quick and direct. We always stay at the Palm Garden when we are in the LA area. The beach is near and there are a number of very good restaurants close by. The staff is helpful and very cordial. We stayed at the Palm Garden Inn while we were visiting friends in Santa Ana and spending time on the beach at Huntington Beach. The hotel location makes it easy to get to both places with a minimum of fuss. The hotel is clean and the rooms are very good-sized. The suite we had was large and had two comfortable beds. We will return! Quiet Orange county location. Perfect for vacationers (with cars visiting Disneyland, Knotts's Berry farm and the many beautiful south facing beaches. Easy drive to all of these area attractions. Great value for vacation travelers. I'm a native of S. Ca. that recently moved out of state but return regularly for business. I know S. Cal. very well and this location, for the money, is a hidden gem. "i like this hotel as it is clean, safe and closed to the places I visited while I was in Orange county. i will come back"
This was the perfect place to stay prior to going on a cruise out of Newport Beach. We were looking for a place that had a complete breakfast because we had an 8 AM deadline in Newport Beach. It worked out well because we barely made our deadline. But, we did have to skimp on breakfast. The summer last year, we had a chance to come and stay at this hotel. And this year we also had one more chance. We hope next year we will have another meeting, we would select this hotel for our team to stay. We recommend our friends to keep on staying in this hotel. This is a nice hotel and it is convenient due to close to a commercial area. "Booked wrong night, GREAT Customer service. " Just need a room for 1 night close to Marina Pacifica and I screwed up and booked the wrong night. Luckily they had 1 extra room and they agreed to wave the cancellation fee, even though I booked through Hotels.com. Vi at the front desk was a ton of help with any questions I had and when I let her know I was checking out at 5:00am informed me of the breakfast to go. Pick 3 items and they will have it ready for you when you leave. Pool and spa our nice over all it's a nice hotel at a reasonable rate. Nothing fancy about it but clean and like I mentioned above an EXCELLENT staff. Staff very accommodating although upon arrival I had to return as there was a sign on the locked lobby that they had to leave and would return soon. Wanted guest to wait. Very warm in my car so I left and returned. Parking a bit tight, beds very comfortable and fairly quiet for being off a main hwy. I would stay again but a bit disappointed in the outdated and somewhat deteriorating bathroom. check in was a breeze, room was clean and pool was nice. internet worked great and staff did a great job. I did eat breakfast there and it was clean and abundant. it was just a one night stay as I was traveling through. picked this location to attend a near by location of recreation. stayed here with my child and she loved the pool and breakfast as well. this is my second time staying at this location in the past two years. 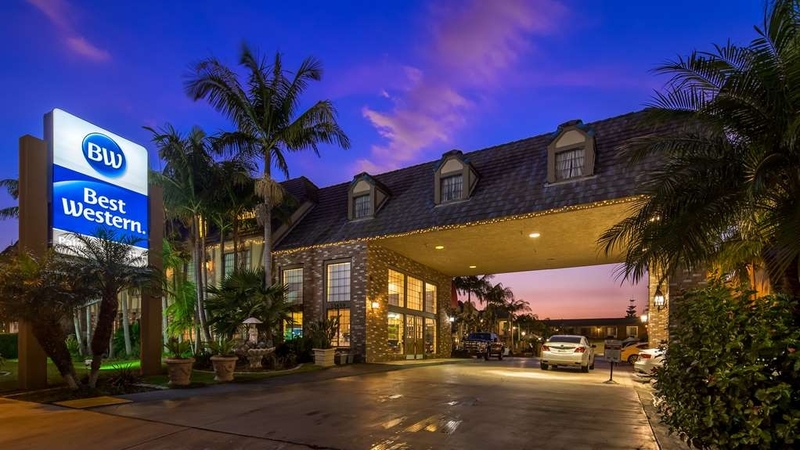 I stayed in many hotels in Orange County in the past but I really like this BW Palm Garden Inn for the convenience, the staff, the cleanness, the parking, the reasonable price, One thing I don't like is to stay upstairs with many heavy luggages. I did and will recommend this hotel to friends. We enjoyed our stay very much and the staff were very friendly and kind to us. Only issue we had were no elevator to second floor and the bed was very hard. 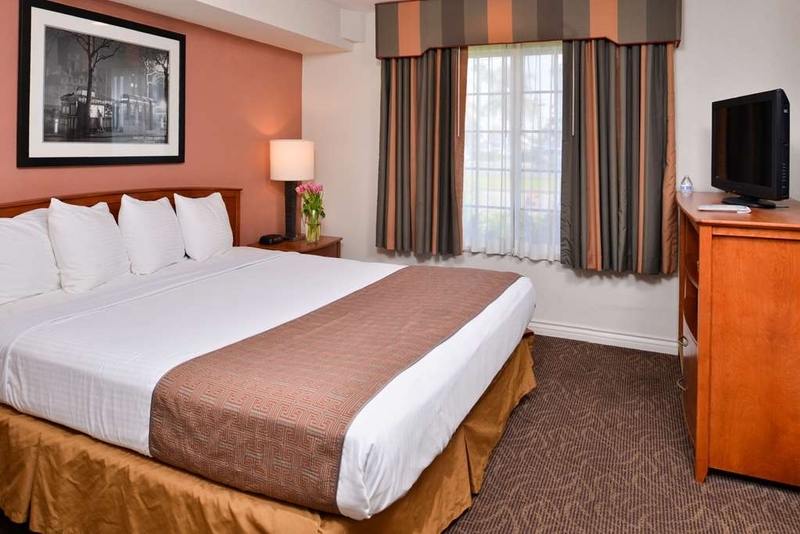 This hotel provides convenient access to Disneyland with easy freeway access along with access to other stores and shops in the area. All in all we enjoyed our experience with this hotel and the staff. "Worth every penny..always our first choice"
Best Western main reason we stay is the employees nicer than anywhere just like in Hawaii. You feel happy and comfortable next is price then cleanliness then location then breakfast and pool but mostly the workers all work hard especially front desk girl name Allie.wish them all the best. Pool looks dirty. Room is bad. When we came in, there is paint splattered on the pool. Room smells bad, made one of us get a headache. Made us all want to get out of there fast, which we did the next day. Not relaxing. Staff's okay, but breakfast is not good. I have visited this location several times in the past. Most places that I have returned to seem to deteriorate over time but not this place. It just seems to get better every visit. It is cleaner than almost all of the hundreds of places I have stayed over the years. The staff is better than 3 and 4 star hotels I have stayed in, even better than the 5 star hotels in France. Everyone is as friendly as can be. Every time they see you they ask how your doing and ask if there is anything you need or that they can do for you. The location is fantastic and close to Disney, Little Saigon, Beaches. All just a short drive away. They have free newspapers and a very nice breakfast. I have stayed in many places in this area and am so glad I found the Plam Garden Inn. I will continue to stay here on future visits to the area. Great Service and comfortable bed. Clean. Pool and jacuzzi were clean and nice. Breakfast was good, more that just cereal and yogurt. Great location - close to freeway and coast. All in akk a great place to stay. Excellent customer service from everyone. Little Saigon right outside the door. You could walk to two Vietnamese restaurants. Traffic is very busy all the time. Very good BK but did get tired of boiled eggs. Michael, VI, Jessica and Ellie at the front desk were super. Michael recommended places to eat. Short drive to Anaheim and Huntington Beach. Thank you for taking the time to share your experience with others, we greatly appreciate it! 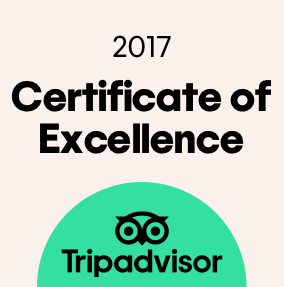 It was a pleasure to have you stay with us and we are thrilled to have exceeded your expectations! We hope to see you soon! The Jacuzzi in the living room is a great feature for a very relaxed stay. The cleanliness of the location and the courtesy of the staff are seamless. The air conditioning was very comfortable during an extremely hot day and the TV had all my favorite channels. Breakfast included fresh waffles, cereal, sausage patties and pastries, and hard boiled eggs. That with a cup of coffee and orange juice was just enough to start my day. 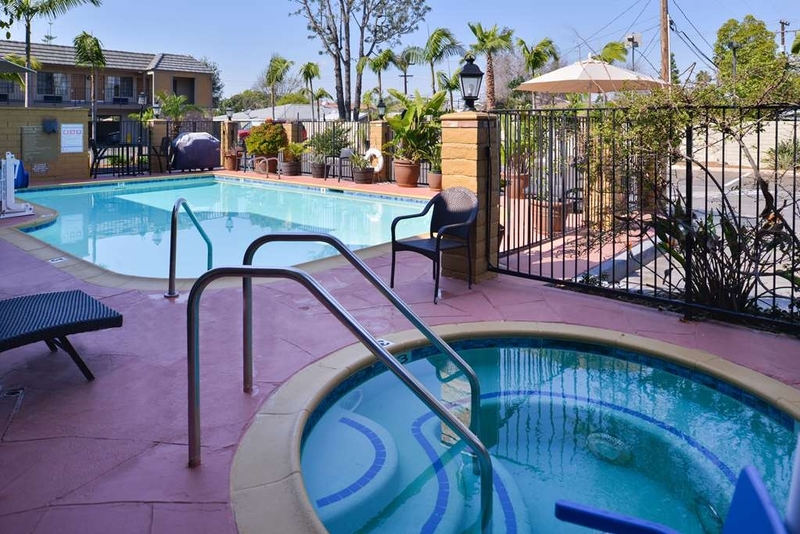 "The BW Palm Garden is a great place to stay in the Anaheim/Westminster area"
Only 7 miles from the Anaheim Convention Center/Disneyland, the BW Palm Garden is a great place to stay. The garden-like exterior sets the atmosphere for a relaxing stay. The pool/hot tub are very well maintained. Great breakfast, comfortable bed--what more can a guest expect. Visiting the area for the first time and wasn't sure what to expect. Room was nice, property was well maintained, staff was helpful and friendly, and they even surprised us with a crib in our room for our infant. We stay at a lot of Best Western properties and this was quite nice for the price. "Get what you pay for." Just wanted a place to sleep and that is what we got. AC is flaky and lights flash (they are on some timer motion sensor. Bed was comfortable and it was quiet. Close to knots berry farm. Breakfast is you standard BW. I doubt I would stay here again, but value is good for the area. "MY FAVORITE HOTEL IN SOUTHERN CA." 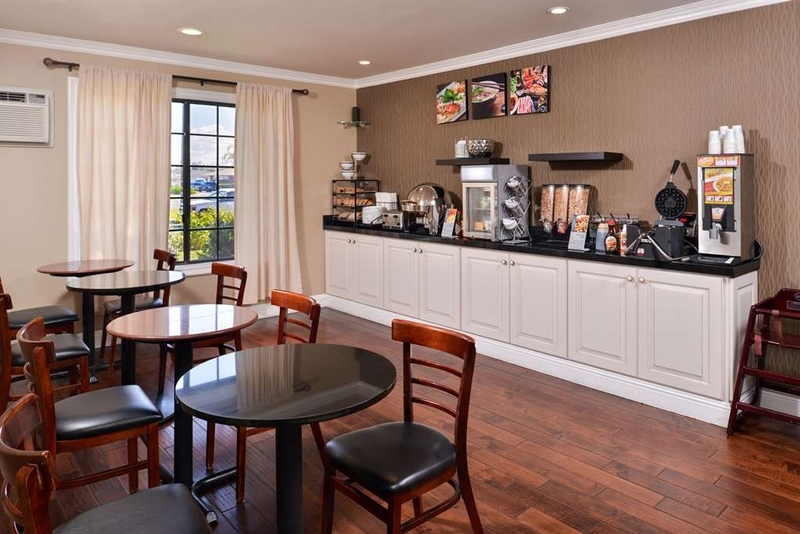 Excellent hotel to stay at when in southern ca., hotel is clean and well organized, breakfast is one of the best that I have had at a hotel of this size. the rooms are very clean and well decorated with all the things you need. Pool is also clean and has a nice hot tub. Hotel is only a few miles from the ocean and many attractions. I would not stay in any other place when in southern Ca. Initially we thought room looked nice and was large. Walls are thin and so is ceiling. You can hear other guests moving around. Person above us took shower or bath after 10pm, which we got to hear, and then our shower backed up when theirs drained. Sounds like it happens when we asked about it. Going to bed with a partially full bath tub because we have children and can't have it unclogged at this time of night. Like the uncarpeted floors--feels clean! Big room with good AC and low noise. Comfortable bed and good towels. Looks recently updated. Front desk and cleaning people are helpful. Small but adequate pool. Because it is a "Disney commute" inn, park availability near your room changes often. Hotel has made recent renovations which are pretty good; just need to wash uncarpeted floors more often. Otherwise, we are quite satisfied with this hotel. The breakfast is presented nicely and is adequate. Great location for Westminister Manor wedding. Staff very helpful, and friendly. Allowed us to make several changes to our reservation. Spa room nice. Pool was clean. Great rate. Clean rooms, comfortable beds. Internet worked great. Keurig coffee makers in rooms!!! The toilet was broken to the point that to flush it we had to open the tank and flush it manually. The shower head was basically welded to the wall. Our towels were damp, fingers crossed they just did not spend enough time in the dryer, but it wasn't worth the lingering suspicion that they were previously used. The rooms did not seem to have any sound proofing. We could hear everything, and when some of the rooms closed their doors our walls shaked. The breakfast was also really questionable. The sausage looked like it was boiled and their were cracked and stained hard boiled eggs. Other than that it was all sugar filled pastries and cereal. This hotel had excellent service from front desk to cleaning ladies. They cleaned our room immaculate all 3 days we stayed there. The breakfast was good, the pool was sparkling clean. The grounds are kept really clean, and the staff is helpful and friendly. We were very satisfied with our stay. The location is 20 minutes from Huntington Beach, and 20 minutes from Seal Beach. They have roll a way beds that fit in the rooms with 2 beds, which is really hard to find down there! The beds are super comfy! Stayed here the weekend of April 23. We were exploring Long Beach and all the hotels there were either very expensive or did not seem like good hotels. Came across this one and the price was good and had good reviews, so we decided to take a chance. The hotel is about 15-20 min. from Long Beach and about 10 min. from Huntington Beach. We were very happy to find this Hotel is very nice! It may have been a motel at one time , which I loved, I prefer smaller hotels with rooms that open to the parking lot and not a long closed hallway. The rooms looked very nice, maybe even newly redecorated. Large room, sink outside of the bathroom, microwave, fridge and a Keurig coffee maker. Free breakfast that was very good, eggs, sausages, waffles, cereal, breads, coffee, tea etc... Front Desk was really nice, helpful and friendly.Close to many restaurants and stores, safe neighborhood. If needing a hotel within this area I would stay again! Great location, friendly staff and FREE wifi in each room. The room was clean and came equipped with a microwave and fridge which was very convenient. there is ample parking that is free and the location felt safe. highly recommend this bw! Great staff, beds, hospitality and we felt that we were welcomed. We were treated with respect and outstanding service every day. It was one of the best hotel experience in over 6 years. We were given directions to the beaches, shopping and to the local Farmer's market. This is definitely my go to place when I'm in SoCal. My main trip was to go to Los Angeles, but I made sure to book this specific hotel 40 miles away, because of the quality of the place. I've tried another Best Western in Westminster but it was nowhere near as nice as this place. I'm definitely coming back. The front office girl during my check in was very helpful and extremely friendly. Made my check in experience real welcoming. Answered all my questions, polite and informative. I would recommend coming to this hotel. "Not bad but disappointed "
I stayed with friends for 4 days last week and the stay was not bad but there were some issues. 1. I was not greeted as a Diamond Rewards Member. While this may not appear to be a big issue, Best Western values itself on making their rewards members feel wanted. 2. My fridge did not work. They brought a second one and that one did not work. They ended up buying one. 3. I was told by two employees, including Vi, the employee that checked me in, that a roll away bed was free. We needed it for one night and I was charged $10 for that night. I was disappointed. $10 is not going to make or break me and I considered calling Jessica, the manager but decided that $10 was not worth it. I don't think I will be staying here again. It was a pleasure. I was told I would get another 500 points for during the survey at checkout.The staff was always considerate and worked hard on my reservations for all stays. We enjoy the cleanliness and decor of the hotel. It is close to our respective residences. It is a good place to take a date night. The Internet is excellent and fast. The A/C might need some upgrades for two rooms. Go back to scrambled eggs and sausage and or bacon. "no back up power when out of electricity in room"
no back up power when out of electricity in room and called front desk many of many time and no respond. it was on morning around 7 when we are getting ready for business court at 8 am and room blackout when i was in shower and wait for 15 minutes before tried to call front desk to see if there is back up power in hotel but there are no one respond and disapointed when hotel have no back up power. 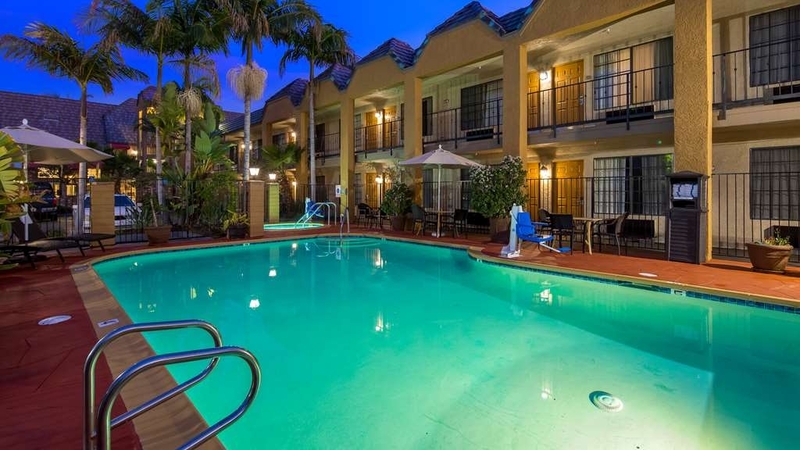 "Great Hotel Minutes From The Beach"
Great hotel about 10 minutes from Huntington Beach. The staff is friendly and the rooms are large, clean and modern. Down the street from several restaurants, gas stations and a Starbucks. Highly recommended hotel! I work in Orange from time to time and look forward to my stay at this Best Western. The staff really goes out of their way to make you feel welcome and they are so attentive. Great service, price and location. "We Stay Here Several Times a Year"
This is a great place for the money paid. We always stay here when we are in the area. 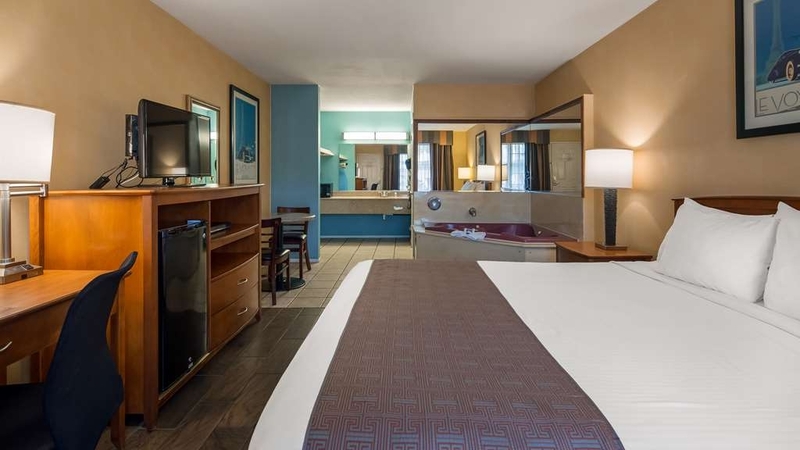 Rooms are spacious, beds are comfortable and the in-room whirlpool bath is very, very nice. Staff is always pleasant and they provide personalized service. Really do love this place! The location is central to everything. My husband loved the food truck outside! The rooms are nicer than I expected and bigger, too. Very accommodating with a crib for our small child. The breakfast was okay a few of the days, with bacon and eggs, but other days had hard boiled eggs which I didn't prefer. Not a lot of seating for breakfast and a bit of a strange layout, but fine. The pool is cold....even in the hot weather, I don't think the water is heated. I enjoyed the hot tub, though. Overall, a great experience. Highly recommended. We visited this location on 2/20/16 & 2/21/16. Enjoyed our stay immensely! The room was very clean, close to the pool, and quiet! The breakfast in the morning was great and the staff was extremely helpful and polite. Loved the spa bathtub as well as the softness of the bed. We were going to Knott's Berry Farm and Disneyland and this hotel is conveniently located near both locations. Only a short drive to Huntington or Laguna Beach as we'll. For the price and location, I will definitely be visiting again! I did not care for the hammering and pounding above me for three hours while I was trying to rest. The breakfast was a D+ and not really worth the time I spent looking over the menu. the staff was attentive and listened to my concerns, time will tell if any of these issues are reconciled with me. This hotel is such a great value for someone who frequents hotels regularly. It is clean and decorated pleasingly. The staff is friendly and accommodating. It is very close to Huntington Beach and local shopping centers. It's quiet and their breakfast selections offer something for everyone, even the fitness/health minded like myself. Love that they offer boiled eggs and bananas. We will definitely be regulars for life. Came for a softball tourney and this was a great hotel. The staff was excellent with anything we needed. I will stay here whenever I'm in the area. The breakfast was good and good choices. Very quiet place and very comfortable. I was greeted by a friendly front desk staff both checking in and leaving. This is an older building but has great charm. I would recommend this to any type of traveler from business to family. It's a great value for the location and the amenities. 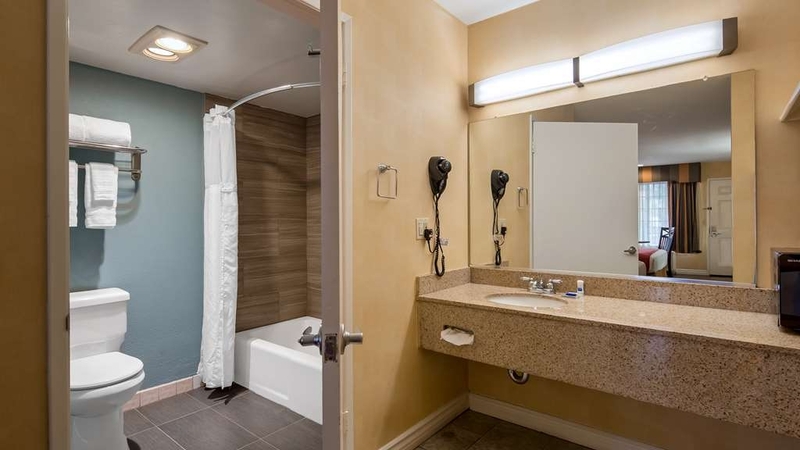 "Great location, clean rooms, comfortable bed.... washroom could use a makeover"
Stayed here when I went to a four day convention at the Anaheim Convention Center. It was about a 10 minute drive. The facility was extremely clean. As a matter of fact, I saw a staff member sweeping the parking lot one morning. The staff was friendly and extremely helpful when I asked questions about the area and/or directions. Lots of stores close by. The room was clean, beds were comfortable. The only negative was the washroom. It was clean but dated. No big deal thou. The pool and hot tub were clean and close to the rooms Free continental breakfast was good. I would not hesitate to stay here again. It's no Hilton, but it's clean and for the price well worth the money. 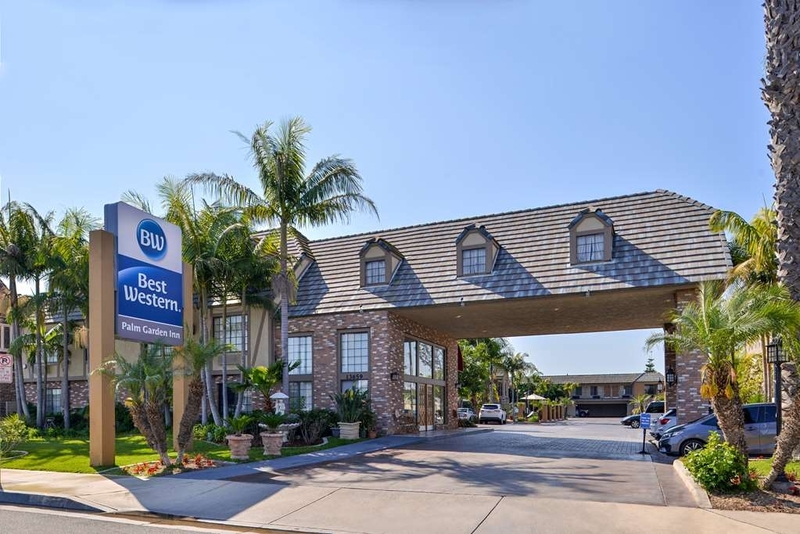 "Impressive Stay even at a sad time"
I needed a find a hotel to stay near Cypress CA for my aunt's services and checked Best Western which I am very glad I did. Very impressive remodel to the room, Clean and nicely arranged. Friendly staff and good layout for breakfast the next morning. "Great location for theme parks and beach"
great location for beach, theme parks, shopping, freeway access. Room was clean, need to use better quality materials when updating room flooring. Hot and cold water is switched. No towels in pool area. When we entered the room, we noticed a bit of a funky smell, but they had left the window wide open so it was diluted. We eventually closed the window and turned on the heat and took a shower. That's when things got horrible. There was a chemical odor coming from the bathroom that was so intense my eyes burned and I had to hold a shirt over my mouth to breathe in there. We left the window open overnight, but still both woke with significant nausea. We should have moved rooms, but we were exhausted. We felt that there was no way they could not have been aware of the odor in the bathroom. Aside from the odor, the sheets were like sandpaper, the pillows were lumpy bits of foam, and the mini fridge, and I mean mini, barely functioned. Hotel staff was very nice and the rooms seemed pretty quiet-we didn't hear our neighbors. Would not stay here again. We stay at this hotel because of the location to where we want to visit and for the cleanliness and amenities. Like I stated bef0ore the only two problems I had at this visit were the beds needed to be replaced and the tile grout in the bathroom needed to be scrubbed clean as it was quite stained. The handicap room we stayed in was not at all what we have experienced in other motels. 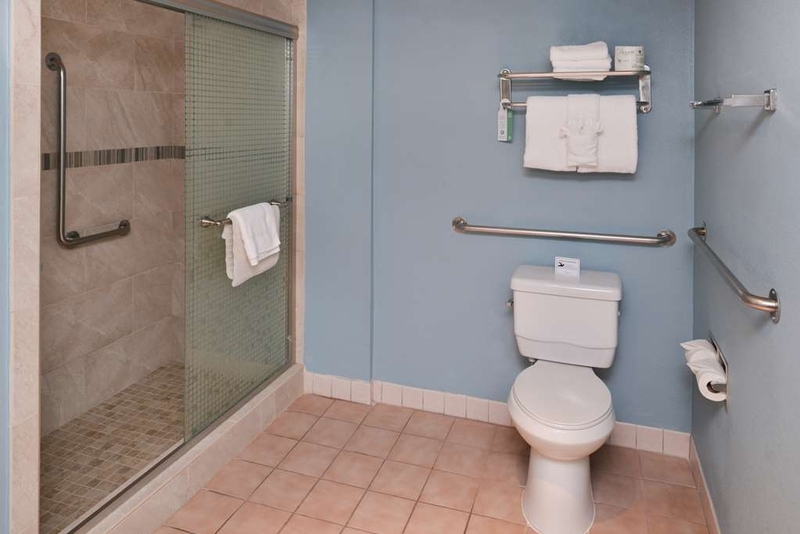 No walk in shower and grab bar in the wrong place and sink & counter top @ a very high level for wheelchair customers. Very clean room. just like home. staff very helpful. People at front desk where alway friendly and very helpful giving directions. They would print out google maps which help us find our way around to the sights, beaches and restaurants we want to go to. "I Chose Average Because of the Breakfast"
This motel is interesting as its a sub station for an ambulance company. Which to me means probably less chance of people coming in and messing around since the ambulance station is active 24 hours a day. The room was clean, they hae linoleum on the floor which makes it look very clean. The chairs were so so for comfort. Even though the breakfast was hot, the eggs were uninspiring and the bacon under cooked. Parking spaces are very narrow. The price was good for So California. Good experience staying in this clean, comfortable hotel. We were in the area visiting family and stayed here for 5 nights and returned for 1 night (following a weekend trip to Las Vegas). A special thanks to Tony on the Front Desk - he was always very helpful, enthusiastic and friendly. 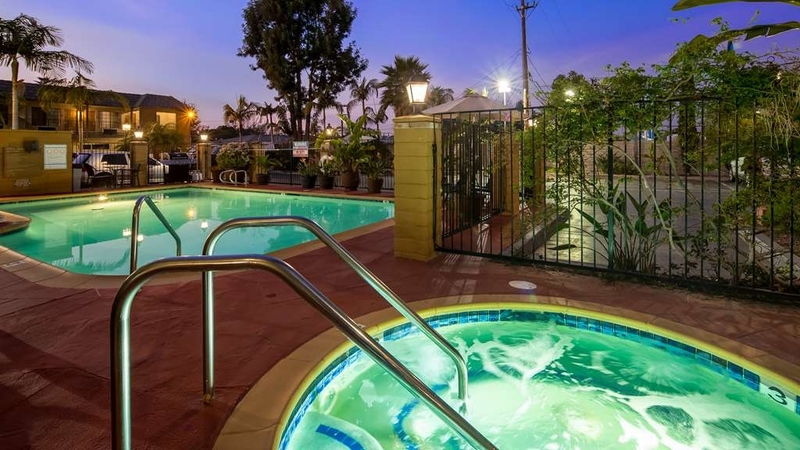 "Best Western Palm Garden Inn, Westminster, CALIFORNIA"
We had wonderful service from a thoughtful, friendly staff. The hotel was in a good location, very near the wedding venue, and the price was reasonable. Further, our room was quiet, clean and comfortable. We enjoyed our stay. We liked this hotel. It has nice people working there. The food was good and the food servers were very nice and helpful to the people eating there. We especially liked that the beds were hard enough. You did not sink to the bottom like a lot of places these days. The room was roomy and comfortable and the bathroom was a reasonably good size. We had a very pleasant stay at this Hotel. Very welcoming Staff. Very happy and Friendly. Very well situated to the coast. Parking was easy. 24 hour front desk. Very helpful especially Junior and his co workers. Breakfast very good. 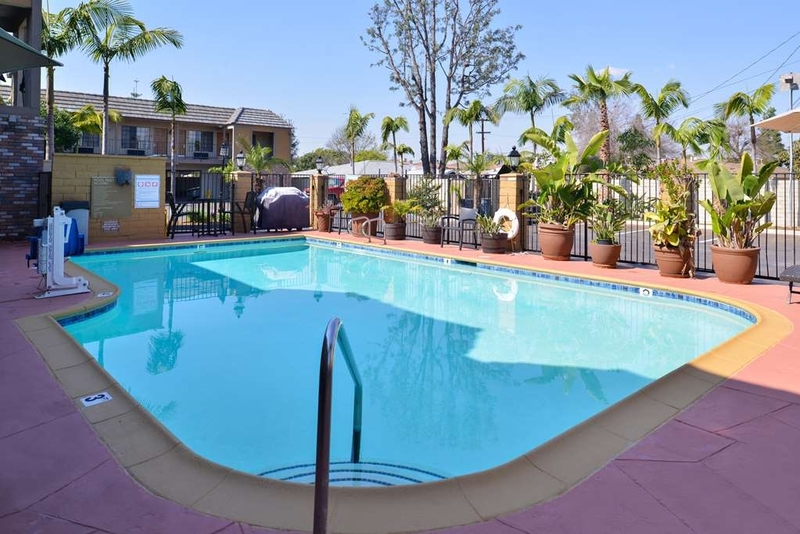 "A great place to stay, convenient and close to Anaheim for less money!" A pretty nice, well maintained property overall. Decent continental-plus breakfast with a pretty good item assortment. Quiet room, wood or wood-type floor in lieu of carpet is an interesting decor choice. Friendly staff. Comfy beds. Could not get the climate control to just stay on "fan" mode. Noticed cigarette butts being left on the floor of the upstairs exterior walkways and stairs for days on end....may be new, may be the same ones, but they stayed there throughout our 5 days there. Decent price alternative to staying in nearby Anaheim. The hotel is clean and comfortable. The staff is very friendly. Great Wi-Fi connection. Comfortable bed. Great value for the amenities (fridge/microwave/ironing board). Loved that they provided sealed disposable cups. "Perfect Place Close to Disneyland Area"
Overall great place to stay, from the front desk we had Tony who was very friendly, helpful, and provided excellent service. The complimentary breakfast had a nice variety of food with some hot dishes such as bacon, sausage links, scrambled eggs, and fresh hot waffles. Our room with 2 queen beds was clean, quiet, comfortable, nice area,and near the pool and jacuzzi.The maids provided 1st rate service. We were centrally located with short driving distances to Disneyland, Knotts, the beach, John Wayne Airport ( SNA ) and freeway access, such as the 405 and 22. The price was affordable and we would highly recommend this place and we will definitely stay here again. I booked this Best Western hotel because of the comfortable stays I have had at previous times. My husband and children were attending a conference for our business of Moss Removal. They had several days of trainng and I knew they would need good comfortable rest. The beds at the hotel were comfortable, the room was clean, and the staff was friendly and helpful. We would definately be staying here again. 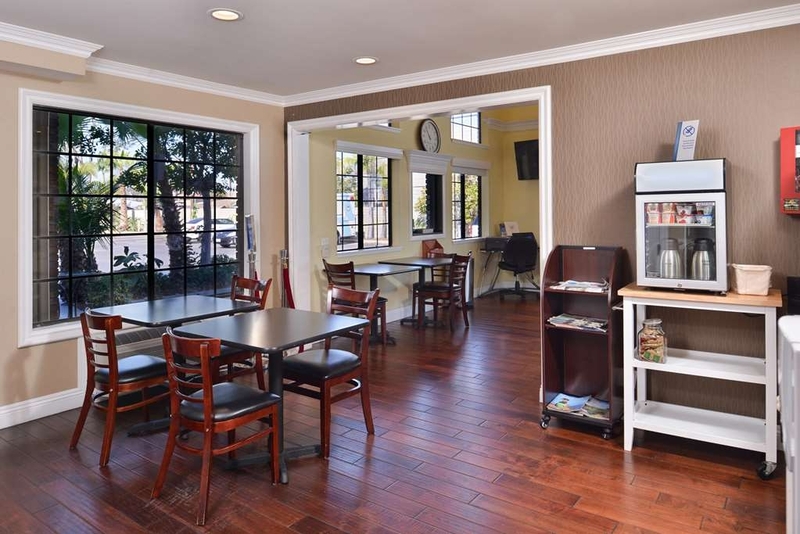 The Best Western Palm Garden Inn is a great place to stay in Westminster, CA. We came for a basketball tournament and picked it out of convenience/location. We couldn't have been happier with our stay. The rooms are beautifully remodeled. The staff is so accommodating and friendly. They brought extra towels immediately when asked. They brought extra pillows up late on Saturday night after I told them my son sprained his knee in a game and needed to elevate it. The breakfast is lovely, tons of food and so fresh! They even offered to clean off our table! Such great customer service by everyone on property. I would definitely stay there again when I'm in the area. Thank You ALL! "An overall great place to stay!" Friendly staff, clean room with lots of amenities, nice pool area with attractive plants, handy location to name a few. Plus, near beaches and attractions with lots of nearby shopping and restaurants. No complaint. Room is excellent according to value price. What else can you find in Westminster area for this kind of motel with peace of mind. I searched around everywhere and always end up booking at this motel for more than 15 years. I would recommend this place to stay. It is close to many attractions. the room was great and comfortable. the staff were very helpful and polite.This is the third we stayed hear. This is a great value for the money. "Great Stay for Disneyland Trip"
My husband and I recently went to Disneyland & California Adventure park for a few days and stayed at the hotel. I was very pleased with the hotel overall. The staff was friendly with any interaction we had with them. Our room was clean and in fact did have the "hard-wood" floors pictured, which made it feel even more clean. The bed was comfortable and their outdoor pool/hot tub area was also nice. The breakfast area could get a little hectic each morning but they had a reasonable selection of items that varied a little each day and the staff did an amazing job at keeping everything restocked as it ran low. It was within 15-30 minute drive from Disney depending on traffic and ultimately very convenient for the price. I would recommend it to anyone wanting to stay near the parks for an affordable cost, but willing to drive to and from each day. This is the perfect place to stay, whether long term or short, I wouldn't want to stay anywhere else! Tony and Jessica are fabulous and go above and beyond to make sure our stay was top notch. And it was! Breakfast is more like what the higher prices hotels offer, rooms are pristine clean. A lovely hotel with a "tropical" feel and an excellent, caring staff. Clean room and everything worked. Whenever we stay at this hotel, we try to book a spa room even though there is a hot tub on the property. Repeat guests book this hotel early--don't miss out. 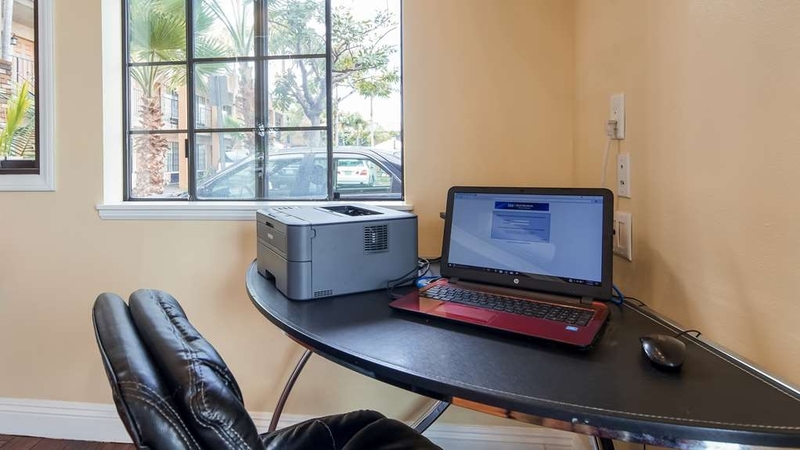 "Nice stop not too far from LA and close to the beaches !" Nice hotel, not too far from LA and close to the beaches and Disney. Spent 4 nights, great stay ! Friendly and efficient staff. Basic room but clean with all the facilities you need. At breakfast, you can get waffles, bread, danish, cereals, yogurt but also (differs each day) eggs, sausages, hamburgers, bacon,....) and of course coffee and fruit juice ! This hotel is 15 min from Surf City, 30 min from Long beach. 5 min from multiple restaurants and shops (Bella Terra shopping center) So don't hesitate, book this hotel for your next stay in LA ! I know where to stay for my next trip to LA !